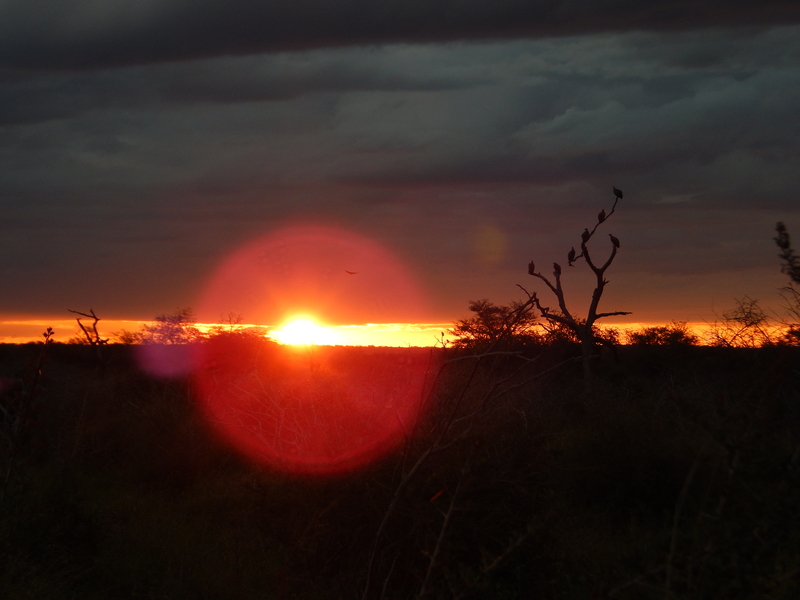 Sunset on our first day in Kruger National Park, as we raced to reach the Lower Sabie Rest Camp gate before it shut for the night. I’m kicking off the revamp and reactivation of my personal blog with a day-by-day accounting of my May 2017 road trip through South Africa. Be ready for photos. Lots of photos. So. Many. Photos. I had wanted to visit South Africa for more than 20 years, mostly because of the chance to see Great White sharks up-close and in the wild. Because Jaws. I know, I know, a lot of people see Jaws as the movie that bumped GWS up to Public Enemy #1, led to mass hysteria and an uptick in hunting them. But for me, Jaws was hugely positive. I was a little kid when it came out, just a little bit older than Sheriff Brody’s youngest son in the movie. 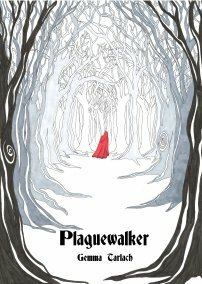 My grampa took me to see it, and it was the first movie I ever saw where I was distinctly aware that my reaction was different than that of everyone else. I was rooting for the shark. I wanted the shark to be okay (spoiler alert: it wasn’t). I was mad at everyone for trying to kill it when all it was doing was being a shark, doing the sharky things it had evolved to do. To paraphrase Andre the Giant in my all-time favorite movie, it’s not the shark’s fault she’s the biggest and the strongest. I became obsessed with GWS and, decades later, when I learned there was a place off South Africa where you could see them up close, I knew I had to go there. Aaaaaaand…decades after that, this year, I finally did, with one of my Ice Peeps (Tori, who went with me on my 2015 trip to Iceland). We got a great fare and, while we floated the idea of doing nothing but sharkin’ the whole two weeks, one cannot go to South Africa and miss out on the terrestrial wildlife and the Cradle of Humankind. So here’s the first entry of a mostly-photo accounting of our ambitious itinerary. After flying in from our respective homes and meeting up at JFK, we flew direct to Johannesburg on South African Airways. I’m going to do a post on tips for others who want to see South Africa on the cheap, so I’ll just say here that my overall impression of SAA was positive, though on both flights coming and going I swear they had the thermostat jacked to about 78 degrees. So I didn’t sleep at all, but I did get caught up on recent movies. We got in to OR Tambo International Airport a little early but had to wait a good long while, first in immigration and then at the car rental counter. About four hours later, we had our car and were on the road. The highways through South Africa were in great condition. After dealing with washouts and other horrors during my trip to Georgia last year, I was expecting more of the same, but the highways east out of the Jo’burg area were of near-Icelandic quality, which is saying something. Because of the delay at the car rental counter, once on the road we zoomed along without stopping. 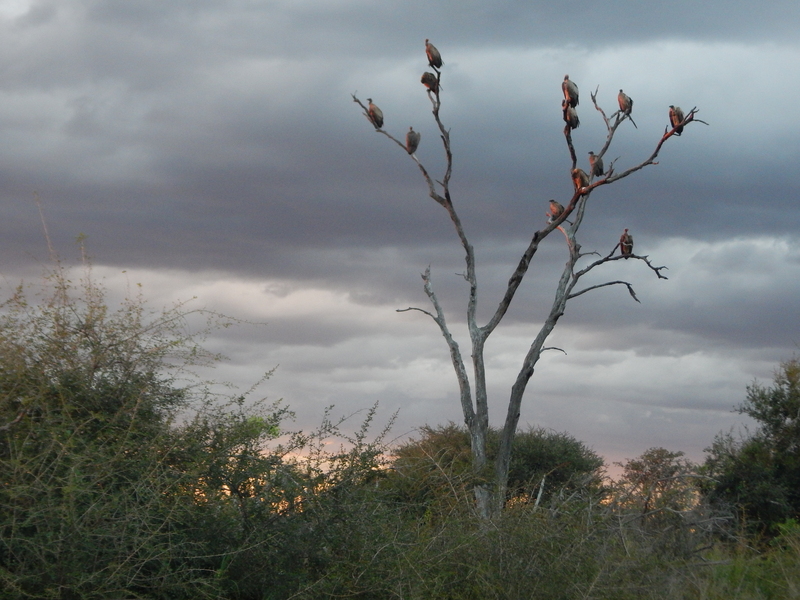 Our destination was the enormous (and famous) Kruger National Park, more than five hours’ drive to the east. 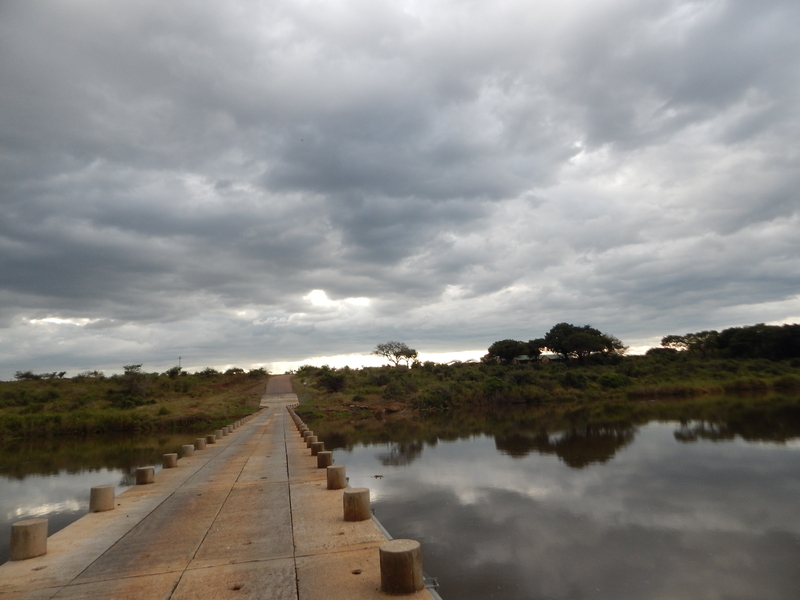 Crossing Crocodile Bridge and entering Kruger National Park. No sign of the bridge’s namesake animal, though the river itself is the Crocodile. 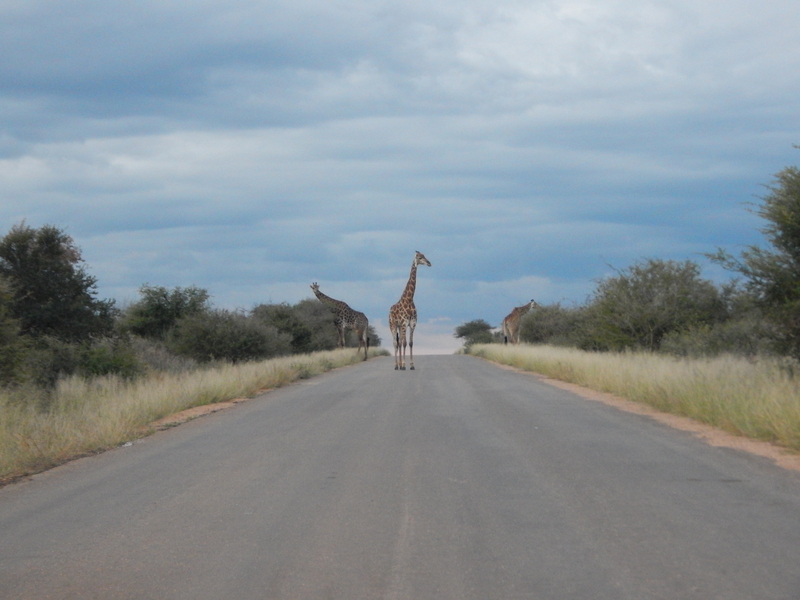 Kruger can be daunting if you’re planning a self-drive safari — so many options! So much territory! — but the great news is that you can do a self-drive safari. Just you and your car. No group tours or huge buses or tight schedules with timed bathroom breaks and stops at a store you have no interest in. 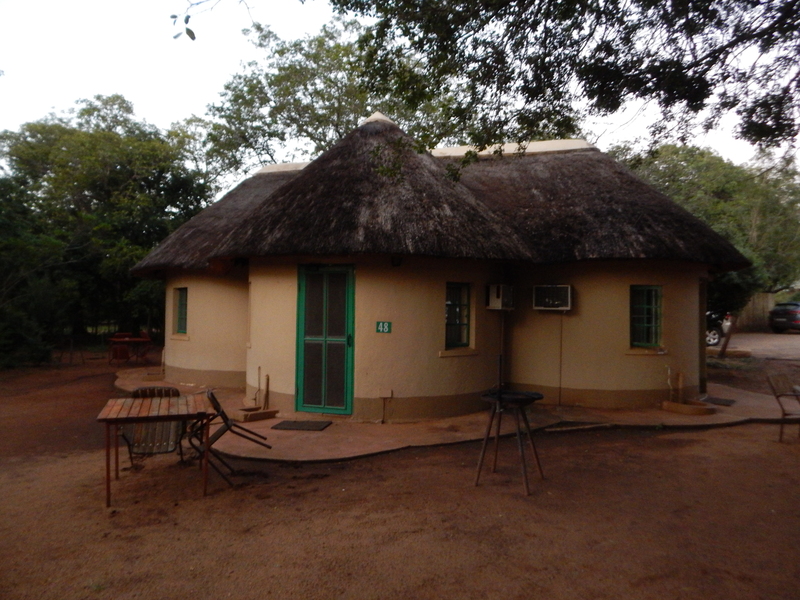 We had done a lot of research planning this trip and decided to spend each of our three nights at Kruger in a different rest camp, where accommodations range from bringing your own tent to cute little huts. Because of our limited time at Kruger, we chose to stay in the southern half of the park where the game viewing is better and the infrastructure more developed. We entered the park on its south side very close to the border with Mozambique, at the evocatively named Crocodile Bridge. 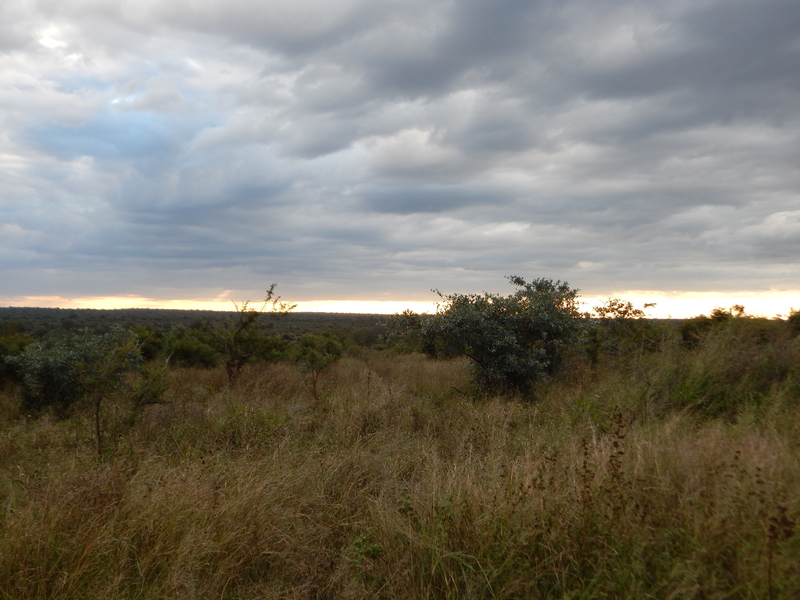 Loving the clouds over Kruger National Park. Our first elephant! We kind of lost it over this guy. Yes, there was an elephant, some distance off the road, and we both were giddy about it, taking way too many photos as if this was the one and only elephant we would ever see. Little did we know what would happen the following day, but I’m getting ahead of myself. 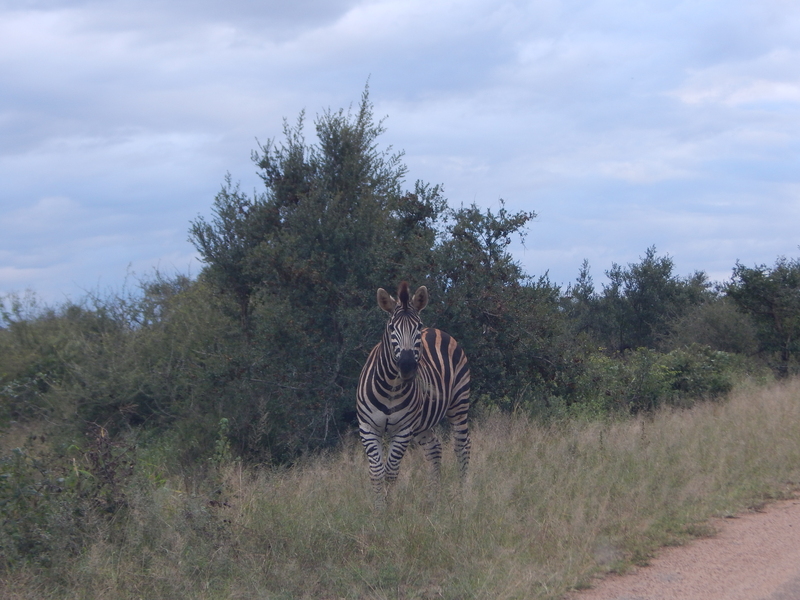 We passed more grazers, including this zebra, right by the road as you can see, chewing his dinner and curious about us. Maybe even, I daresay, hamming it up for the camera. Not the first zebra we saw, but the first one close enough to the road to make eye contact and show a little personality. 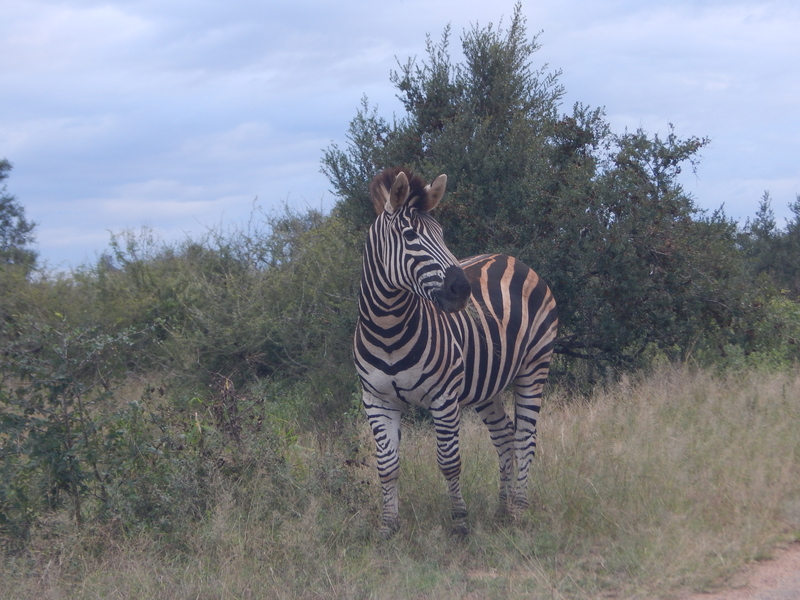 As it turned out, of all the animals we saw, I think the zebras were the biggest surprise for me. I’ve never thought much about zebras but I found them delightfully expressive. While it was thrilling to see all these animals wandering about, we were starting to get nervous. The gates of all the camps inside Kruger close at sunset, for obvious reasons (the aforementioned wandering animals, some of which can get a bit bitey), and we did not want to get stuck out here. It’s not like they make you spend the night in the wild, of course, but it would inconvenience the rangers who have to come and get you, plus there’s a hefty fine. We stopped. I shot a couple quick photos with my point-and-shoot while Tori, much more of a photographer than I am and with much nicer gear, set up her camera. Lioness and her mane squeeze, strolling across the road right in front of our car. Yeah. So. That just happened. I remember we were both looking at the tree when something — I’m guessing movement from the corner of our vision — made us both turn our heads in unison and watch as a lioness emerged from the bush, a gorgeous black-maned lion behind her, and casually strolled across the road. Another shot of the male. I had my camera resting on the steering wheel and without thinking just started pressing the shutter button, hoping that my sometimes fussy camera had focused itself. The entire lion episode took maybe two seconds. Then they were gone. 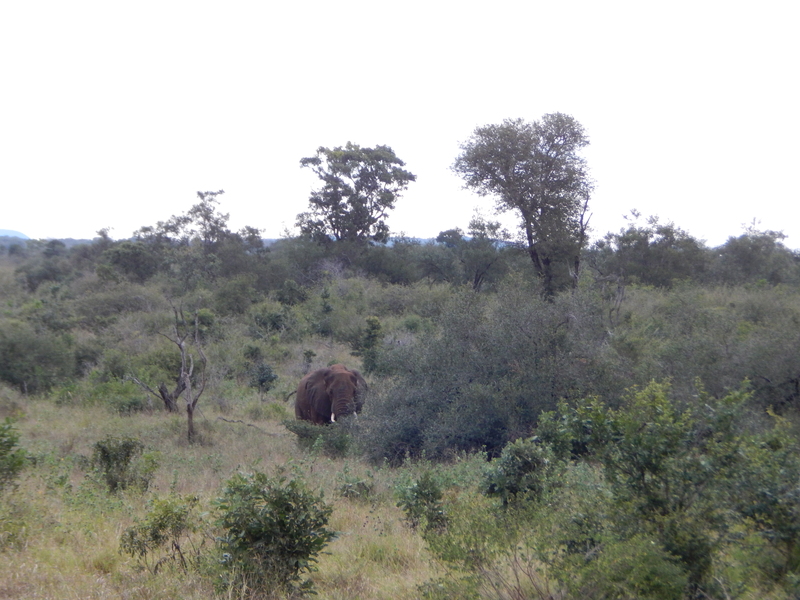 We couldn’t even see the grass moving as they passed deeper into the bush. Because I hadn’t slept at all on the 16-hour flight, I had been awake for about 36 hours by this time, including about six hours of driving on the “wrong” side of the road (I actually prefer driving on the left, but whenever I do, it does take me a full day to get used to it). I was willing to believe my brain might be making stuff up. 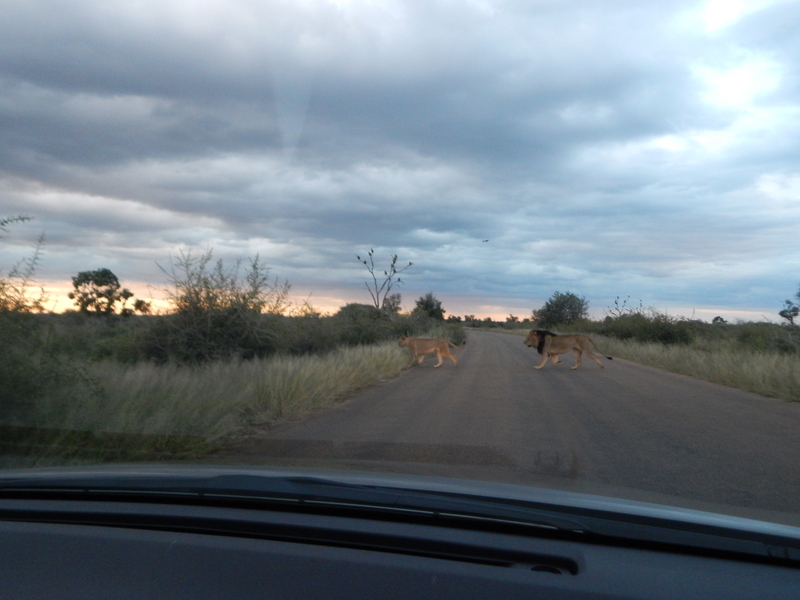 But no, two lions had crossed in front of our car. 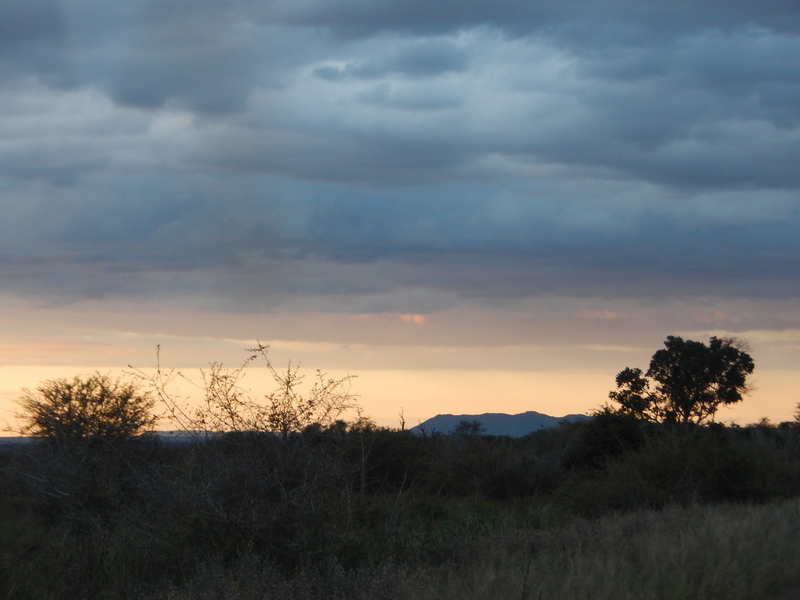 Energized, ecstatic, incredulous, we couldn’t wait around too long, so when nothing else showed up, we continued on towards Lower Sabie and…the next roadblock. The first giraffe power trio we saw…there were many. They seemed to travel in threes. Giraffes do not care what time gates shut for the night. This trio was just hanging out, gloriously, and we could do nothing but sit and watch them. 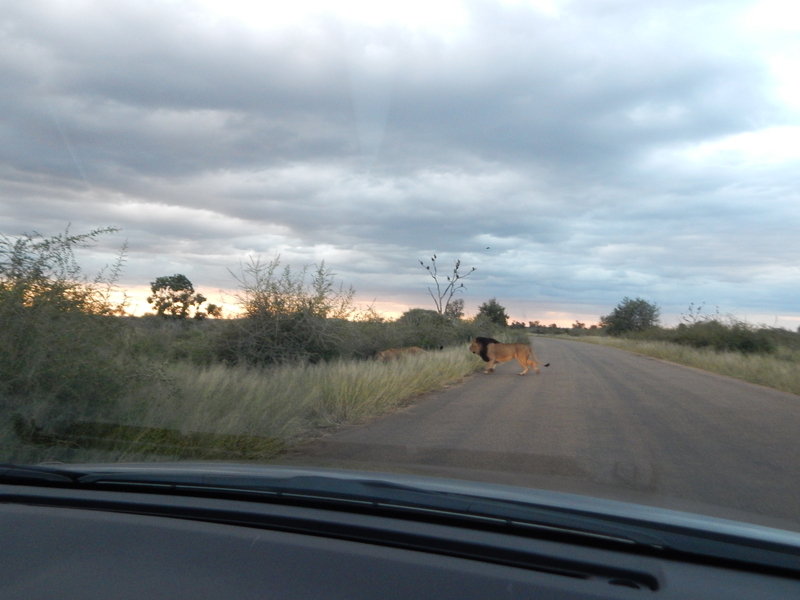 It would have been worth paying the fine for not making it to Lower Sabie before the gate closed, but the guy in the middle of the road eventually stepped aside. For a moment. Yeah, the quality isn’t great, but I love this photo. As soon as our car rolled by (despite the race to get to the gate, I was driving about walking speed. 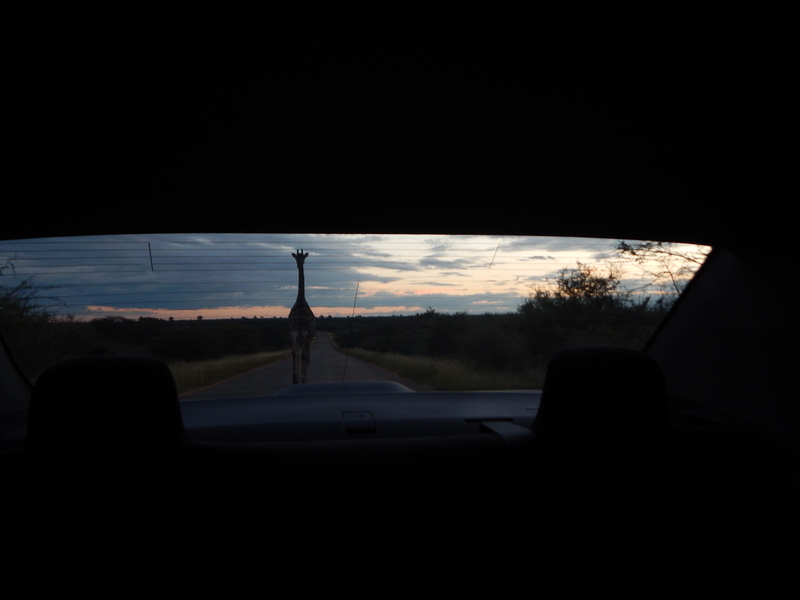 The last thing in the world I wanted to do was hit one of the many amazing animals we were seeing), the giraffe who’d stepped aside to let us pass got back on the road and followed us for a bit. And, with two minutes to spare, we made it to Lower Sabie before the gate shut. By the time we checked in and picked up our key to the hut we’d booked, it was pitch black, the night full of birdsong and sometimes lions calling to each other. We opened the windows to listen and were asleep within moments.